Russian ambassador to Ukraine Mikhail Zurabov explains in interview to Rosbalt why Kiev has little time for economical reintegration with Moscow, talks about new ships for Black Sea Fleet, outlines new approach to Russian compatriots living abroad, and why it is so problematic for Russia and Ukraine to write common schoolbook on history. 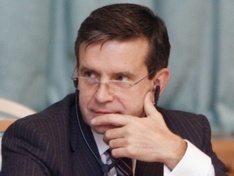 Mikhail Yurievich, after Kharkov agreements [between Medvedev and Yanukovich] it has been said much both in Moscow and Kiev about pooling of assets in strategic industries – Gazprom and Naftogaz, Rosatom and Energoatom, United Aircraft Engineering Corporation and Antonov… But things haven't budged an inch so far, have they? After Kharkov agreements Ukraine faced additional opportunities to take very balanced and rational approach. Those agreements helped Ukraine to balance budget for current year and, hopefully, for further several years. Of course, Ukrainian leaders should draw an inventory of those projects which some time ago could make the basis of Russian-Ukrainian industrial and hi-tech integration. Even such uncomplicated project as creation of joint aircraft industry now faces numerous problems, just because Ukraine has lost the wide range of former capabilities. Ukrainian partners need significant investments to launch serial production of "An" aircrafts at their own facilities. That is just one example. Thus, Ukraine surely needs time to apprehend the current situation. Indeed, they're making good use of this time. Also, it should be noted that we do make first steps towards economic cooperation. Agreements in the area of nuclear-power industry have been signed. Hopefully, in the nearest future we will sign a contract on completion of 3rd and 4th nuclear units [Khmelnitsky nuclear power plant]; once tender on construction of nuclear fuel plant is finished, one may expect that the plant would be built under Russian technologies and with Russia's participation. It's incorrect to say nothing happens. The movement is in progress, although not so fast as it was demonstrated in Kharkov. Perhaps, Ukraine's just playing for time to get support from Moscow and then would say sorry we've changed mind? We consider Ukrainian counterparts should once again comprehend their potential contribution to Russian-Ukrainian joint projects. I'm talking of shipbuilding, nuclear-power industry, aircraft engineering, and energetics. To be sure, that is reality. When speaking of lost opportunities, they are most obvious in the area of energetics. Decisions to build South Stream and, probably, second branch of Blue Stream, starting to construct North Stream indicate that Russia reasonably seeks for alternative directions. Once those projects and Samsun-Ceyhan oil pipeline are implemented, once we can talk of completion of Baltic Pipeline System-2 and development of crude oil loading terminals in the Baltic Sea, once additional east-oriented oil-and-gas pipelines are established, Russia's problem of marketing outlets for energy resources will be resolved. And it may happen some day that Ukraine’s gas transportation system would not be of previous interest. In other words, it is undesirable for Ukraine to drag out creation of transnational companies in strategic industries, right? In other words, we're just at the point we began from. On the one hand, we understand that Ukrainian partners need time to comprehend. On the other hand, time moves on just like in chess game. And by the way, it is not Russia's turn to move a piece. We consider backup options in all areas, beginning from building of helicopter engines to construction of oil-processing plants instead of using Kremenchug Oil Refinery in Ukraine. Nowadays, Russia sees its uplift not only due to availability of financial resources, although the world crisis undoubtedly affected us, too. Russia is dynamic because of stable political system, and that is extremely important in bad times. Such environment gives us huge capabilities for economic growth and implementation of large-scale projects. Again, since political relations between Russia and Ukraine have been considerably strengthened, we must pay regard to current Ukrainian environment in every issue. We constantly remind, however, that all those decisions have to be made within historically short period to have time for realization as competitiveness in such areas is rapidly growing. You must have heard that a number of Middle East gas producers have finished construction of large gas liquefaction factories, built potent transport fleet, and sign contracts of liquefied natural gas delivery to European states. As long as American market is closing because of exploration of shale gas for liquefied gas, the environment is very dynamic and competitive. Russia won't lose its positions at energy market. Having such a locomotive, Ukraine should use a unique opportunity to conduct modernization. Considering that formerly Ukrainian and Russian industries constituted an integral unit, modernization is preferably to be synchronous. But that's not to say that the two countries could not realize those projects separately. What is in store for Black Sea Fleet? On the one hand, Kharkov agreements removed the problem of its withdrawal from Sevastopol. On the other part, the fleet's current status is unenviable: obsolete ships, staff reductions, array of social problems. Will the fleet be renewed? This issue is in the purview of Russia's highest political officials. Vladimir Putin recently held a meeting in Novorossiysk and discussed not only establishment of basing sites but development of Black Sea Fleet too. As far as I can see, renovation in ship strength is also provided – both by building of new vessels and redeployment of some warships from other fleets as well. Beyond all doubt, ageing process of Black sea Fleet will be suspended. Besides, Russian president set a task to modernize national armed forces not only within the framework of current military reform but also with upgrading weapons and communication systems. Obviously, all that regard to Black Sea Fleet too. Hopefully, the fleet's problems which have not been settled for a long time will be resolved in the nearest future. Other side of the shield is Medvedev's order to develop the fleet's coastal and social infrastructure. This is what BSF servicemen and their families use and could be used by other residents of Sevastopol. The draft program on this issue will soon be reported by defense minister Serdiukov to Medvedev and beginning from the next year will be practically implemented. But that is only one part of plans; yet it is not a time for speaking of îther projects. Undoubtedly, Russia will do beyond Black Sea Fleet renovation. Does Russia agree to buy Ukraine? I don't mean the country but the cruiser which has been staying at Nikolayev shipyards almost completed for many years. Within my recollection, Ukrainian party broached this issue three times. Dmitry Medvedev showed prudent interest and tasked to return to the question once again. The problem of completing the cruiser is associated with two circumstances. First is armament. Since it was initially supposed to arm the ship with noncurrent weapons, the cruiser has to be transferred to St. Petersburg for installation of new arms. That is a cruise around Europe, so one must be hundred-per-cent sure that the ship is capable for it. Second, if the vessel would be completed at 61 Kommunara Shipyard in Nikolayev, it is necessary to assess staff qualification and technical capabilities of the yard. That is why we expect a group of authoritative Russian experts to come late June and visit mentioned yard and other factories; they will evaluate not only the cruiser's status but generally Ukraine's capability to complete it. Apparently, their conclusion will be reported to Russian highest officials. Is it true that Moscow renounced an idea to give a "Russian blank check" to compatriots living abroad? There's a rumor that new laws will provide them with some privileges like entrance to Russian colleges. Indeed, this topic was sounded at the World Congress of Compatriots. We should take note that support of Russian diaspora is still an urgent problem. Presently, the draft law is under consideration at the State Duma which will regulate the broad range of issues related to status of compatriots. The congress was held to specify existing problems and to discuss some provisions of the coming law. Perhaps, similar initiatives would be fixed in laws. We are committed to eliminate any kind of discrimination against our fellow nationals, since they are people who consider Russia their historical motherland. We should open wider our colleges for Ukrainian and Belarusian youngsters, recant a system of quotas and entrance limitations into Russian educational institutions for those categories, and cooperate closer in the region of education. By the way, talking of education. Will the common Russian-Ukrainian schoolbook on history be published? There were some high-profile statements of Ukrainian authorities that the work on such book was in progress, and then the information was impugned or something. Is that only talks or reality? Well, it is very hard to create a book without some basic concords among historians. Common fundamental postulates have to be founded at the level of experts to be developed then in schoolbooks. First steps in this direction have already been made. Academician Tolochko has recently written an interesting and professional work analyzing the common-cultural cutoff of shared Russian and Ukrainian history. The author points at common roots which subsequently sprouted as state formations. To my mind, such fundamental works could lay the foundation for further stages. So, the movement has been started and I think such schoolbook could be really published.